The church was consecrated in December 1970. The Rev. 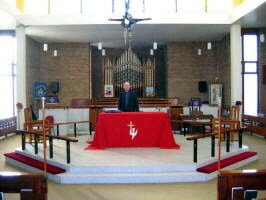 David Boyland - Rector, pictured in St. Hilda’s Church, Kilmakee, Dunmurry. Rowan Drive, Seymour Hill, Kilmakee, Dunmurry. When the Northern Ireland Housing Trust started building the housing estates of Seymour Hill and Conway in the 1950’s the Diocesan Council obtained a central site for a church in this rapidly expanding area. The rector, Rev. Canon R.C. Ellis, and select vestry of Dunmurry Parish accepted the responsibility of caring for those moving into the new estates. On Whit Sunday, 20th May 1956, the clergy began services in Kilmakee Orange Hall, and these continued until a dual purpose church/hall was dedicated on 17th May 1958. 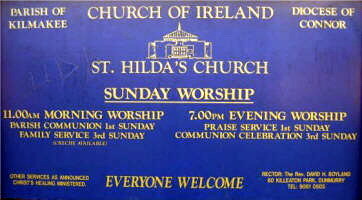 As Dunmurry Parish is known as St. Colman’s, it was very fitting that their daughter church should be dedicated to St. Hilda, who so ably supported St. Colman at the Synod of Whitby in 664. Such was the rapid extension in the area, that on the 1st August 1964, the Diocesan Council constituted the area as the Parish of Kilmakee. Plans were put in hand for the erection of a church, and Mrs. R.C. Ellis cut the first sod on 28th June 1968. On 15th November 1969, Lord Grey of Naunton, Governor of Northern Ireland, laid the foundation stone. The Bishop of Connor, the Rt. Rev. A.H. Butler, consecrated the new church on 19th December 1970. St. Hilda's is a modern building with the sanctuary at the centre, providing a constant reminder that God is in the midst of us. The cross suspended over the sanctuary was designed and sculptured in copper in a modern abstract form. The ceramic plaques in the porch depict St. Hilda, St. Colman crossing the River Lagan, and Sir Fulke Conway, a prominent local landowner of the 17th century. The organ was a gift from St. Andrew's, Belfast, which closed in 1970, in its centenary year. The side chapel was built as a Chapel of Rest, to be used for private prayer and meditation. The glass panels between the Chapel of Rest and the church can be opened to take an overflow congregation. The cross on the east wall is the cross that was used to mark the centre of the sanctuary on the occasion of the cutting of the first sod. The present Rector, the Rev. David Boyland, was instituted in May 1998. When work started on building the housing estates of Seymour Hill and Conway in the 1950s the Diocesan Council obtained a central site for a church in this rapidly expanding area. The rector, the Rev Canon R C Ellis, and the select vestry of Dunmurry parish accepted the responsibility of caring for those moving into the new estates. In May 1956, the clergy began services in Kilmakee Orange Hall, and these continued until a dual-purpose church/hall was dedicated in May 1958. As Dunmurry parish is known as St Colman’s, it was very fitting that their daughter church should be dedicated to St Hilda, who so ably supported St Colman at the Synod of Whitby in 664. Such was the rapid extension in the area, that in August 1964, the Diocesan Council constituted the area as the Parish of Kilmakee. 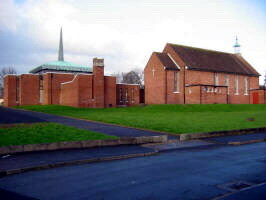 The new church was consecrated on 19th December 1970. The organ was a gift from St Andrew’s, Belfast, which closed in 1970. The side chapel was built as a Chapel of Rest and the glass panels between the Chapel of Rest and the church can be opened to take an overflow congregation. 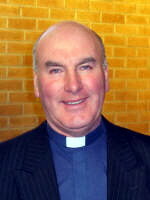 The present rector, the Rev David Boyland, was instituted in May 1998. Johnny McLoughlin, who was commissioned as diocesan layreader in June 2006, commenced training for the ministry in September 2006 and will be instituted as the new curate of St Mark’s, Armagh in June 2009.